A contemporary five double bedroom, three bathroom property on a southerly facing low maintenance plot set within 2 minutes' walk of the Forest of Marston Vale Country Park. The property was completed in 2015 to a highly contemporary design, with a high emphasis on space, proportion and natural light in the approximately 3,000 sq. ft. of accommodation. The hallway features exposed porcelain floor tiling incorporating underfloor heating and there is an oak floating staircase to the galleried landing. 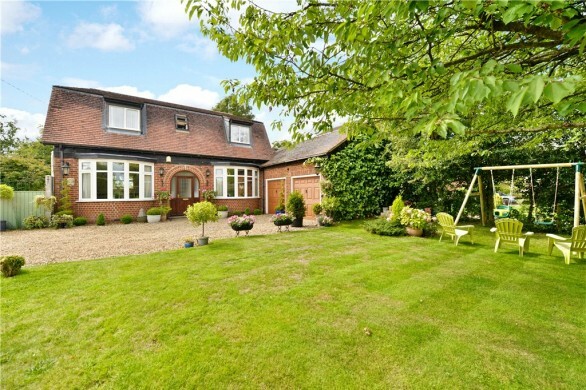 There are three separate reception rooms and an open plan kitchen/breakfast/dining room with bi-fold doors to the garden. There are five double bedrooms, two en suite shower rooms, a dressing room and a family bathroom. The entrance hall features exposed light coloured porcelain floor tiles which continue throughout the ground floor accommodation and incorporates zoned underfloor heating. There is a bespoke contemporary style oak staircase with glazed balustrades to the galleried first floor landing. The cloakroom is fitted in a white contemporary style suite of a wash basin set into a floating oak vanity unit and a WC set into a matching shelved display area and storage cupboard. 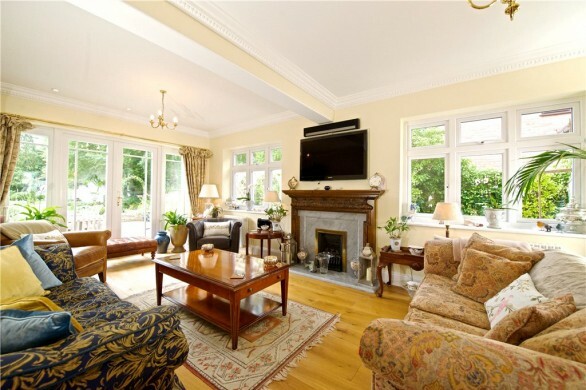 The sitting room has glazed full length bi-folding doors extending the room out into the garden. There is a contemporary style gas fired stove in one corner. The dining room/gym has double doors to the rear terrace. The study is at the front of the property and overlooks an area of designated space. The kitchen/breakfast/dining room has two sets of bi-fold doors set at right angles. 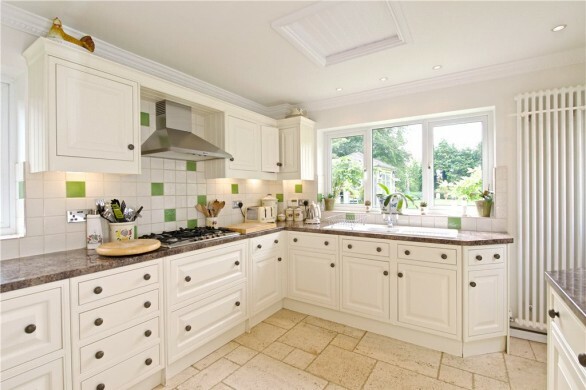 It was fitted, by Noble Signature of Olney, in a contemporary range of Second Nature white high gloss units. The units have Silestone work surfaces and incorporate inset LED lighting. The central island unit includes a breakfast bar for four people. Integrated appliances include two conventional ovens, a combination oven, an induction hob with a concealed extractor, a dishwasher, a separate larder fridge and freezers, a wine chiller and an inset sink unit with filtered water and a boiling water tap. There are complementary coloured splash areas. Doors lead to the garage and the utility room which is fitted in a matching range of units with complementary work surfaces and a sink unit. There is also space and plumbing for a fridge/freezer, a washing machine and tumble dryer. A part glazed door leads to the garden. The galleried landing looks down into the entrance hall and has access to the roof space via a retractable ladder. There is a built-in linen cupboard which has a radiator. The master bedroom has a fitted double wardrobe with full length sliding doors. The dressing room has a bespoke range of hanging, shelving and storage space and an opening into a separate area which is suitable for a dressing table. The en suite is fitted in a contemporary range of white sanitary ware which includes a walk-in screened shower enclosure with a Monsoon style shower, a floating high gloss shelved vanity unit and a WC. There are complementary porcelain tiles to the walls and floor and an illuminated shaving mirror. The guest bedroom is entered via a lobby area and has a range of mirror fronted wardrobes spanning one wall with a fitted contemporary style dressing table. The en suite is fitted in contemporary style white sanitary ware which includes a screened shower enclosure with a Monsoon style shower, a wash basin set into a floating high gloss vanity unit and a WC. There is travertine tiling to the walls and floor. Bedrooms three and four both overlook the driveway and garden and have a range of contemporary style wardrobes. Bedroom five has a recess suitable for a wardrobe. The family bathroom is fitted with a range of sanitary ware including a double ended stone bath with a waterfall style tap, a walk-in screened shower enclosure with a fitted Monsoon style shower, a wash basin set into a floating high gloss vanity unit with matching wall cupboards either side, and a WC. There is complementary porcelain tiling to the walls and floor. The property sits on a private road off Corn Close; it is bound by a low wall with raised iron railings flanked by maturing shrubs within a slate bed. The tarmac driveway has parking for 5 cars and provides access to the integral oversized double width garage which is accessed via two remotely operated up and over doors, inside the garage there are cupboards, which neatly house a gas fired boiler, hot water cylinder and water softener. The garage also house the control units for the under floor heating and the control panels for the solar energy. Information relating to the tariff and its benefits can be provided on request. A contemporary style pathway at the front of the house leads to the entrance door and two areas of artificial lawn are set either side. There is a further path and gate at the side of the house leading to the rear garden which has been landscaped with ease of maintenance in mind. A contemporary style outdoor entertaining area extends the entire width of the house and has a low wall with concealed LED lights beneath. There is a further artificial lawned area which has shaped broken slate borders with shrubs, plants and bushes, as well as a corner rockery, all with coloured uplighters. There is a raised border and contemporary style water feature. Marston Moretaine has a shop, post office, supermarket, church and a village lower school. The independent Harpur Trust schools are in Bedford, approximately 9 miles away. Millbrook railway station is approximately 1 mile away and has services to Milton Keynes Central and Bedford mainline stations. Bedford has services to St. Pancras International taking 47 minutes and Milton Keynes Central has services to Euston taking 36 minutes.